Researchers found out that people who made breakfast their largest meal were less likely to be overweight compared to those who ate their largest meal at lunch or dinner. 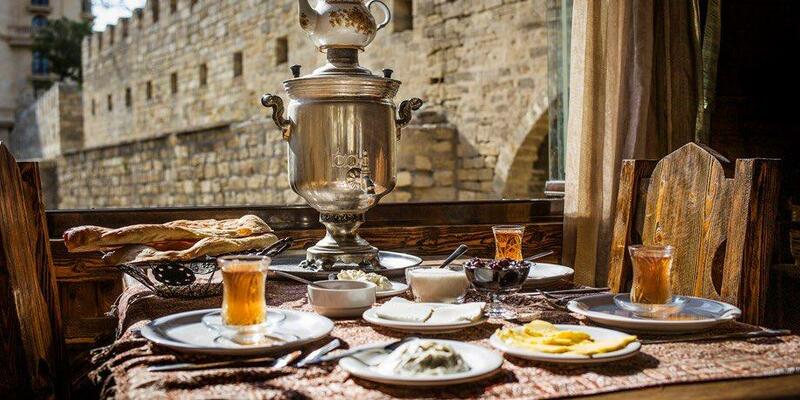 The traditional Azerbaijani breakfast consists of sweet butter, various types of white cheese, cream, honey, tandir and kuku or scrambled egg with herbs. Bread is considered a sacred food in Azerbaijan. It is a symbol of abundance, prosperity. Azerbaijani people can’t really imagine their breakfast without homemade bread, including tandir, lavash, and shirinchorek. Each of them is different in shape, size, taste and smell. ‘Tandir’ bread cooks in the inside of the hollow which has been plastered in surroundings. Bread is cooked by attaching on walls of tandir oven. The bread is also prepared like fragile bread and kept for a long time. ‘Lavash’ is thin flat bread made of water, flour and salt. It's thickness varies depending on how thin it was rolled out. Toasted sesame seeds or poppy seeds are sometimes sprinkled on before baking. Many regional varieties of flatbread are baked in the tandir oven. Cheese comes in numerous varieties of different styles, textures and flavours. Owing to its popularity, cheese plays a key part in Azerbaijan's traditional breakfast. While everyone has their personal favorite, some people like to discover new varieties of cheese. Motal cheese is prepared from sheep milk. The cheese is then broken into small pieces and then packed into a sheep or goat skin, known as a motal for 3-4 months. The cheese has a rather spicy, slightly sharp taste and aroma. ‘Shor’ is a salty cottage cheese. The cheese is prepared from yogurt-based beverage. ‘Ayran’ is converted by heating to cottage cheese. Stretching it through canvas bag, put the mass into the winding and then pour cold brine there. Shake it and put then in a dry place. Doesn’t it seem like dairy is in everything? There’s some kind of milk product in so many things that we eat. Bread and butter are one of the most popular breakfast combinations worldwide. Butter is rich in fat soluble vitamins and fatty acids that are good for health. It's created by churning or shaking cream until it separates into solid and liquid parts called butterfat and buttermilk, respectively. Azerbaijani people are addicted to ‘nehre’ butter which is wonderfully delicious. 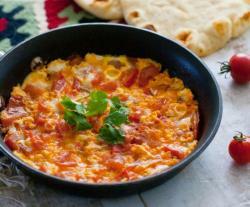 Scrambled egg dish with tomatoes, known as ‘pomidor chighirtmas’i is a simple dish you can serve for breakfast. How is pomidor ‘chighirtmasi’ made? In a frying pan melt the butter over medium heat. Add the tomatoes and cook, uncovered, until lots of juices have released. Pour the eggs evenly over the tomatoes. Then cook, uncovered, until the eggs set. Sprinkle salt and pepper. It's no secret that honey makes everything better, especially breakfast. It contains flavonoids, antioxidants which help reduce the risk of some cancers and heart disease. Honey has a strong and very sweet flavor, so just a drizzle adds plenty of flavor to any dish. Azerbaijanis usually start their morning with a tablespoon of honey. By the way, if you have a passion for all sweet things then Baku Honey Fair is a must for you. Over 300 beekeepers from around Azerbaijan gathered at the fair last autumn. The fair guests are able to taste and purchase many honey flavors, including lime, meadow, acacia, crown of thorns, chestnut, sunflower, licorice flower, sweet clover, etc. If there’s one thing that could be even better than honey, it's a homemade jam. In Azerbaijan, people make jam from almost anything from walnuts to rose petals. Each summer, Azerbaijani women buy large amounts of fruit and sugar in order to make a large supply of preserves for winter. Some popular jams are made from apricots, strawberries, plums, raspberries, mulberries, pears, peaches, melons, figs and cherries. Every year, International Jam Festival in country’s Gabala region draws in thousands of guests who are eager to taste delicious varieties of Azerbaijani jams or as it called here “murabba”. Jam producers from all over the country and abroad arrive in the city bringing with them hundreds of varieties of natural marmalades and jams. If you visit an Azerbaijani home, undoubtedly you'll be served homemade jam along with black tea. Azerbaijan's tea ceremony reflects ancient traditions and local hospitality. Tea is associated with warmth and friendliness, therefore, the tradition says that one should not allow the guest to leave the house without having at least one cup of tea. It is served in ‘armudu glass’ i.e. ‘pear-shaped glass’ with lemon, cube sugar, sweets and jams. Water is boiled in various ways, in particular, in heated metal containers known as samovars. 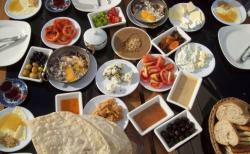 Make your mornings so much easier with declivous Azerbaijani breakfast!